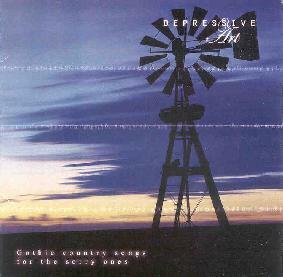 Depressive Art - "Gothic Country Songs For The Sorry Ones"
Swedish ensemble Depressive Art was formed by guitarist Joakim Adriansson and former Beseech singer Klas Bohlin, with an eye toward exploring their mutual interest in 60's psychedelia and dark country music. In addition to Bohlin and Adriansson the band consists of Sanjin Pejkovic on lead guitar, Christian Haglund on bass, Tobias Walka on organ and Peter Gustavsson on drums. My eyebrows raised a bit at first when I read about a mixture of 60's psychedelia and dark country music. But oddly enough Depressive Art seems to have done just that. No... this isn't country music as in C&W. The country influence is very subtle. "United Cosmos" sounds like modern college rock song with a healthy dose of psychedelia and a bit of country in the guitar sound. Ditto for the guitar on "A Summer Day To Me", though this song is much more purely psychedelic, and definitely has a 60's flavor. The combination of electric and acoustic guitars, organ and Bohlin's intriguing vocal style, along with excellent production make for a very full sound. "Satisfied By Greed" is another very good song, perhaps similar to "United Cosmos". I have to say "A Summer Day To Me" is my favorite, though this 3-song teaser has me very curious to hear a full length from Depressive Art. For more information you can visit the Depressive Art web site at: http://www.depressiveart.com.